How do you plan to water? Considered a rain barrel and a rain chain ? Could collect runoff from that roof when it rains and have soft water. My buddy lives in the Coachella Valley. Super hot out there! I'm close to the beach, 20 miles west of Los Angeles in what we call the South Bay. Not only did I redo the veggie plot soil, but also the few hundred feet of concrete planters that line the entire back yard. Most of it has been planted either in the fall or recently, so this is a very exciting time for me as I watch all of my hard work come to life. doesn't seem to be not sure if anyone makes anything yet. Edit: Sorry to edit off the cuff without references. but ...as i recall Bill Gates was investing in this tech for a portable solution to potable water to people in Africa and other remote/war torn/impoverished regions? It certainly shows. Hope rover there doesn't dig up all your hard work. He looks the type to need a good frolic every day. I WISH I had that sun and space to work with whew. Have you considered figs? They do well in drier climates. Some varieties are rather pricey. We have about 7 different types atm. I already have 2 avocado trees, a macadamia nut tree, 2 apples and a kumquat so no figs. lol Figs however do grow really well here, I see them around the neighborhood. If I get any more trees, it will be a dwarf crepe myrtle in a big pot. Just because they are beautiful, but I really don't need anymore trees. I'd vote Frangipani, Mango, Duke of Tuscany because I love jasmine. I read the first post and saw the picture. She has a fine build and looks well taken care of. It's good for them if they have a safe spot they can retreat to just like kids. We had a boxer I loved as a child. Sheba was here name. I have had dogs come from their owners yard to visit and play with me lol. The marijuana beds are complete!! Whew! That took months! Super excited! Just in time. I'm gonna get the clover started this week and bring that bed to life. Do you think it's a coincidence that like 50 bulbs just sprouted right after the Cal-Mag soil drench? Awfully coincidental isn't it? Way more stuff popped up in the flower beds today. 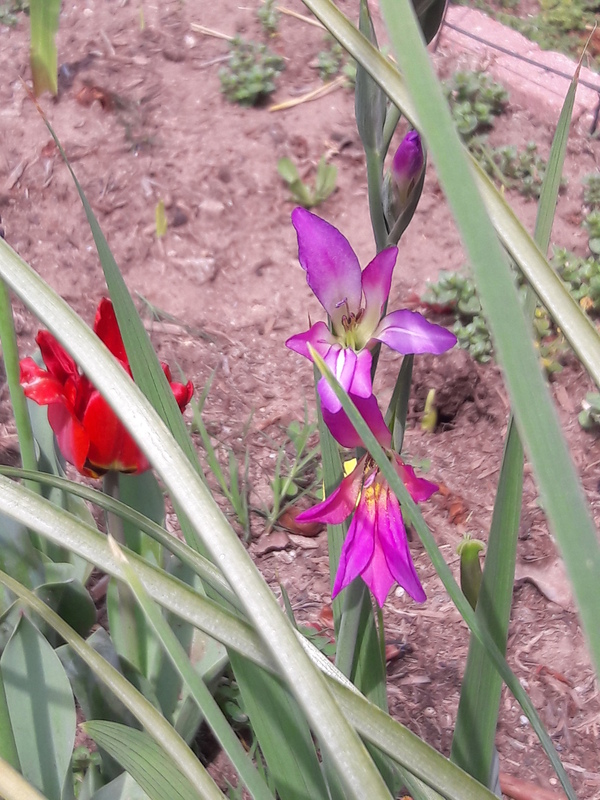 Not even sure anymore what they are except that they are some sort of bulbs. So much fun! I'm kind of bummed in a weird way that the planter is complete, because Dad has been here every Sunday for months now. He's not a spring chicken anymore and any minute he wants to spend with me, I'll take, I have a few projects left, I'm gonna need to figure out a new way to spend time with him. @cannabissequoia unfortunately that only applies to Dad. As little time as humanly possible with Mom is too long. 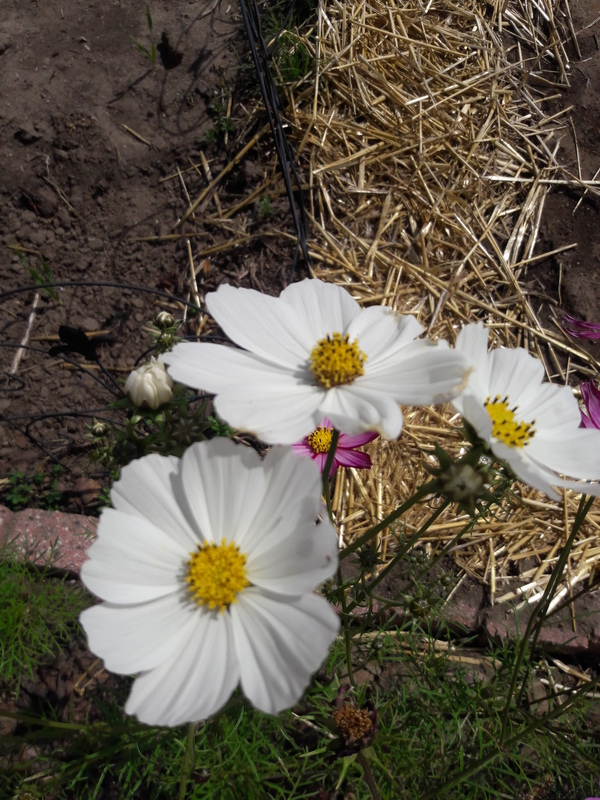 I planted a leftover chamomile from the greenhouse that is already flowering in the new mj bed threw in a few sprinkles of dutch white clover here and there and gave it some water. Let's bring this sucker to life! I learned by doing that wildflowers & similar stuff are waaaay more impressive if planted in fall or late summer. You don't have frost to worry about so try some like that this year. I have a relatively short spring before hellfiredeath season begins & the spring planted ones never get big enough in time. Yeah, my johnny jump up (hedge) that I planted in fall lost it's mojo and is sort of melting down lol. Which is actually okay cuz now the pansy giants I planted in front are blooming. I'm gonna let them seed a bit and they'll come back on their own again in fall, Pretty sure. saw a house with the whole front planter filled with 5 to 6 foot Cosmos in full bloom. They must be not sure how they could be that tall already had it started from seed. Yeah, mine are only like 2 to 3 feet right now. The oldest are anyway. They grew really fast in the greenhouse, same with the chamomile. Both really seem to love going into the soil too. So, they had to have planted them last year. Looks somewhat of an Iris what r u thinking they might be?